Practical set for hybrid manicure – Do it Yourself! 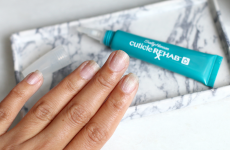 Are your nails fine, weak and brittle? Don’t worry! Meet effective ways for nails extensions, hardening and nourishment. Complete your own set of accessories and nail polishes for hybrid manicure. 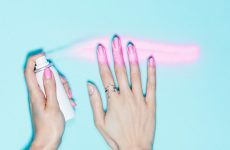 If you only begun to be interested in techniques of painting and decorating nails, start with the simplest methods; use only high quality products. For extension of nails use gel or acrylic. Both substances have form of colourless mass, which can be moulded in any way. Then file excess of gel or acrylic for nail plate to gain pretty shape. To harden nails, you can use Semilac nail polishes or products from other good brands. How can you achieve effect of flawless manicure? First layer of nail polish file gently, then apply second layer of colourful nail polish, and when it dries – fill in deficits and polish everything with nail buffer block. Lastly, cover nails with top coat and place under UV lamp. If you have problem with application of nail polish near cuticles, use thin brush usually used for decorations. Thanks to this trick your fingers will remain clean, and you will not have to use this much of nail polish remover. What gadgets should be in hybrid manicure set? Basic tool is electric nail milling machine. This gadget helps with performing and removing manicure and pedicure, but also in polishing and shortening nails. Equally important equipment is UV lamp, which hardens nail polish. You will also need: gels (Semilac or IBD), acrylic and nail polishes in various colours, acrylic with brocade and liquid acrylic. Rest of gadgets are: files, cotton pads, softening cuticles gel (for instance Sally Hansen), brushes for acrylic and gel, top coat, stickers, cuticles nippers and clippers. How can you make nail oil?